George Stylianoudakis was born and raised in Miami, USA. Growing up, he was aware of his curiosity about discovering the magic rules of cooking and he did not leave it that way. In 1992 he attended the Armed Forces Culinary Program, which included a Management and Leadership Program, Cost Control for Food Service Operations, Nutrition Cooking Program and lasted 1 year. The school’s annex was then hosted by the American Army. Shortly afterwards, Chef received his basic knowledge at the American Culinary Federation by acquiring the Apprenticeship Degree Program during which he studied and worked at the same time in the school. This program lasted for 3 years. He then attended a 6-month program at Alain Ducasse on Mediterranean cuisine, in which he also practiced. Throughout his career he has been stagier in many restaurants with Michelin stars such as Noma, Quique Dacosta Restaurant, Alain Ducasse at Plaza Athenee and has been appointed executive chef to many of the best hotels in Greece. As in Pentelikon Hotel 5 *, Lindos Blu Hotel 5 *, Grecotel Palace 5 *. In the last three years he is the executive chef of the luxury Kensho Boutique Hotel & Suites. 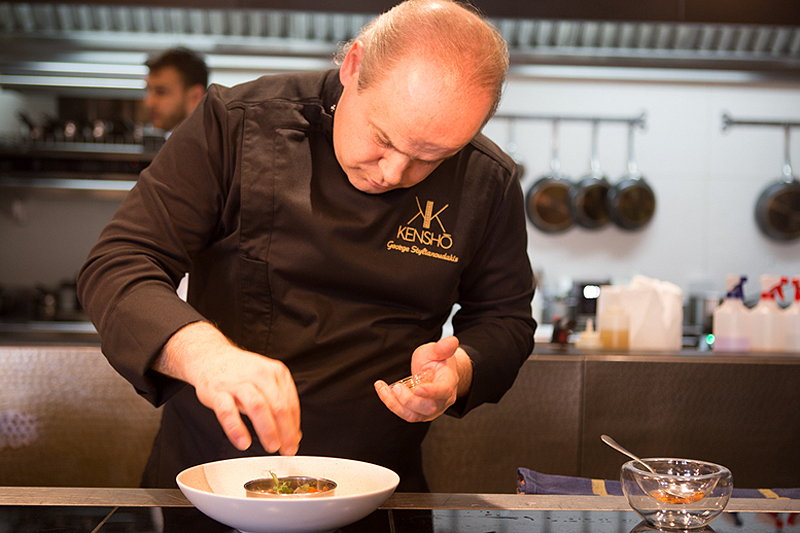 Giorgos Stylianoudakis successfully married his familiar and advanced culinary style, with dishes based on the Greek tradition and worked in a totally creative way and French techniques.